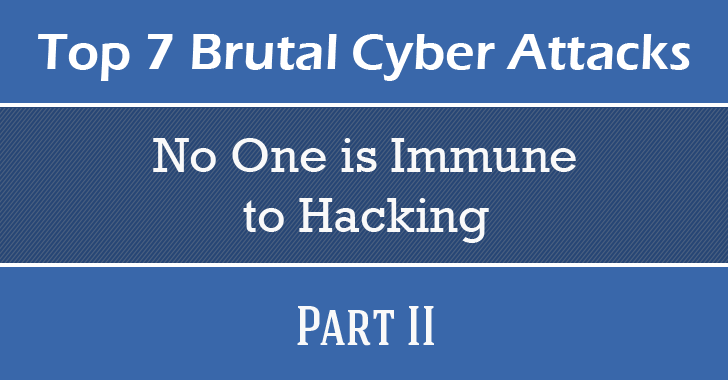 In Part I of this two-part series from The Hacker News, the First Four list of Top Brutal Cyber Attacks shows that whoever you are, Security can never be perfect. As attackers employ innovative hacking techniques and zero-day exploits, the demand for increased threat protection grows. Driving a car is a network’s game now! 'Everything is hackable,' but is your car also vulnerable to Hackers? General Motors’ OnStar application and cars like Jeep Cherokee, Cadillac Escalade, Toyota Prius, Dodge Viper, Audi A8 and many more come equipped with more advanced technology features. These cars are now part of the technology very well known as the “Internet of Things”. Recently two Security researchers, Chris Valasek and Charlie Miller demonstrated that Jeep Cherokee could be hacked wirelessly over the internet to hijack its steering, brakes, and transmission. The OnStar application is an inbuilt unit attached to the interior, rearview mirror of the car with features such as remotely unlocking cars and starting the engines. Similarly, Jeep manufactured Jeep Cherokee’s latest model is the fourth generation car fully equipped with the latest technology advancements. In the recent incidents, Jeep Cherokee, as well as OnStar's application, were hacked leaving the cars as the slaves of the hackers and prone to accidents. A security flaw in the car's entertainment system was compromised by two white hat hackers: Charlie Miller and Chris Valasek. The flaw allowed the hackers to inject malware into the system for remote control from miles away. The hackers were able to turn up the music volume to the maximum and start the windshield wipers remotely while they were ‘10 miles away’. An outrageous act they did was cutting off the transmission and disconnected the brakes that led the car crash into a ditch. The cars' apps, Bluetooth and telematics connecting the car to a cellular network like OnStar are on the same network as the engine controls, brakes, steerings and tire pressure monitor system. Miller and Valasek said a car’s networked system could be an easy gateway for the hackers to come in with just the use of their mobile phones and a laptop. What they need to do is just know the car’s IP address, and they can break into its system through a wireless internet connection. United States Office of Personnel Management (US OPM) is an independent agency of the United States that works to recruit, retain and honor a world-class workforce for the American people. The US OPM became a victim of a cyber attack twice that led to a data breach, compromising personal information of some 21.5 million related to current and former federal workers. Hackers accessed sensitive data of US government officials that could be used for identity theft and cyber-espionage. The stolen data included Social Security Numbers, employment history, residency and educational history, criminal and financial history, fingerprints, information about health, personal and business acquaintances. Some stolen records also include findings from interviews conducted by background investigators that discussed sexual assaults and drug, mental health treatments and alcohol addictions. Investigations reveal that China-based hackers were behind the data breaches at the Office of Personnel Management (OPM). Anthem Insurance Inc., previously known as WellPoint Inc, was a victim of a massive cyber attack in February. Back in February, Cyber attackers executed a very sophisticated attack to gain unauthorized access to the company’s IT systems that had database of some 80 million people and obtained personal identifiable information (PII) relating to its consumers and employees. The hackers gained access to Anthem's data by stealing the network credentials of at least five of its employees with high-level IT access. The path may have been "Phishing", in which a fraudulent e-mail could have been used to trick employees into revealing their network ID and password, or into unknowingly downloading software code that gives the hackers long-term access to Anthem’s IT environment. The company informed millions of its affected customers of the massive data breach that potentially exposed the personal information of its former as well as current customers. Anthem appointed Mandiant, world’s leading cyber security organization, to evaluate the scenario and provide necessary solutions. These are just seven; there are many more! And it could reach you too. The power of the cyberspace and the criminals hovering over it should not be underrated. Chucking such happenings where your personal data is at risk and being irrational is not the solution rather it is the beginning of activities that will bother you big time in the future. The cyberspace is like a dope that is capable of psychoactive effects. A proactive thinking and approach will take you ahead of the people on the other end. Take the time to ponder over the incidents and respond wisely is all we have to say!